Warning lights — no matter what color — cannot be relied upon to create a “force field” that will protect you from danger. Bright, flashing lights can create a visual distraction that’s as effective as a physical obstruction in slowing roadway traffic. 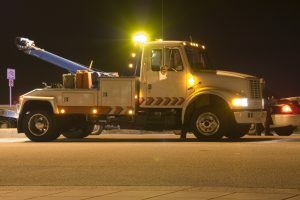 Although tow truck lighting procedures vary from state to state, generally, warning lights should be used only if the tow truck is on the roadway obstructing traffic or if a traffic hazard exists. The indiscriminate use of mega-power light bars can be a contributing factor in traffic incidents for several reasons. First, lights can affect the night vision of oncoming drivers. Even though you may be wearing the latest retro-reflective clothing, they can’t see you because of the glare. Second, people tend to drive where they look, and if they’re concentrating on — or being blinded by — your lights, that may be the direction they drive: toward you or the back of your truck. Third, new light bars with constantly-changing patterns may draw people into watching the light show rather than emergency workers at the scene. Using only enough lighting to warn drivers is much better than distracting them. The over-use of warning lights can easily confuse oncoming drivers, leading to secondary accidents. Traffic incident management procedures advise that minimal use of lighting alongside the roadway will have the least disruptive effect on approaching traffic in both directions. When on the roadway, use warning lights. When off the shoulder of the roadway and not obstructing traffic, tone them down. Warning lights on conventional tow trucks are fixed at a constant height and aimed to warn oncoming traffic. However, when a car carrier bed is tilted, the truck’s taillights are obscured under the carrier bed and the warning and auxiliary taillights on the light bar are pointed down toward the vehicle being loaded — not toward oncoming traffic — making the lights difficult for oncoming motorists to see. In addition, on a tilted carrier bed, the height of warning lights or supplemental taillights above the roadway may make the lights appear farther away than they are, creating a visual-perception problem for motorists. In some states tow trucks are permitted to tow with amber warning lights on at all times, which can be difficult to understand, particularly when a vehicle is on a car carrier bed. Does a truckload of lumber need warning lights? If the operator has the vehicle hooked up or secured properly, why would warning lights be needed? Additionally, when lights are on during a tow, motorists may be watching the glaring lights and not see your tow or brake lights. Recently there have been efforts to advocate replacing amber warning lights on tow trucks with red or red/blue lights — the traditional colors for law enforcement — as a solution to the increasing number of tow truck operators struck on the roadside. But is this the solution? Truck lighting is probably not the fix. Until we can change the driving habits of distracted and irresponsible motorists as well as improve on our roadside procedures and habits, we are going to be in danger. The International Institute of Towing and Recovery (IITR) is a not-for-profit organization with a mission to serve as a source of education and to otherwise support the towing industry in developing tow truck operator training, and to work with those in the educational field in developing programs for the specific purpose of furthering educational opportunities for those in the towing and recovery business. Visit www.iitronline.org. Peter Fuerst is chairman of the board of the IITR, and a 1995 inductee into the International Towing and Recovery Hall of Fame.